Washington, D.C. – Two wildlife biologists, a national religious leader and a Peregrine Falcon testified at a special briefing to the House Natural Resources Committee today to highlight the importance of the Endangered Species Act – our nation’s safety net for fish, plants and wildlife on the brink of extinction. The briefing entitled, “The Endangered Species Act: Benefiting Landscapes, Wildlife and People,” occurred in the midst of several Congressional efforts to weaken protections for endangered species. Recent defense and appropriations bills in both the House and the Senate have contained “riders” that would remove, prohibit or delay Endangered Species Act protections from several imperiled species of wildlife, including the sage grouse and the gray wolf. The Congressional briefing sponsored by 12 conservation and scientific advocacy groups, including American Bird Conservancy, Audubon, Center for Biological Diversity, Defenders of Wildlife, Earthjustice, Endangered Species Coalition, International Fund for Animal Welfare, Natural Resources Defense Council, Sierra Club, Union of Concerned Scientists, Wildlands Network and WildEarth Guardians, was hosted in cooperation with Rep. Raúl M. Grijalva, Ranking Member of the Committee on Natural Resources. According to 2011 public opinion poll, 84 percent of Americans support the Endangered Species Act, including strong majorities in all regions of the U.S. and across both major political party affiliations. More than 1,300 imperiled species of plants, fish and wildlife in the United States have been protected by the Endangered Species Act, and only ten have gone extinct since the Act became law, according to the U.S. Fish and Wildlife Service. Additionally, a study of 110 protected species found that 90 percent are recovering at the pace expected in their scientific recovery plans. Biologists have indicated that the task of recovering a species from near-extinction is a decades-long endeavor. The Peregrine Falcon for example, rebounded from near extinction in 1975 to several thousand breeding pair today. The falcon was declared recovered and delisted in 1999. Cristina Eisenberg is an ecologist and the Lead Scientist at Earthwatch, USA. Her ecological research focuses on wolves and fire in Rocky Mountain ecosystems. She has a master’s degree in conservation biology from Prescott College, and a PhD in Forestry and Wildlife from Oregon State University. Cristina is a Smithsonian Research Associate, a Boone and Crockett Club professional member, and Black Earth Institute Scholar/ Advisor. Her books include The Wolf’s Tooth and The Carnivore Way. She is currently writing a book titled, Taking the Heat: Wildlife, Food Webs and Extinction in a Warming World. For two decades she lived with her family in a remote, wild corner of Montana. She currently lives in Concord, Massachusetts, near Walden Pond. Mary Minette is Director of Environmental Education and Advocacy for the Evangelical Lutheran Church in America Washington Office. She is also the North American representative to the Climate Change Advisory Group for the ACT Alliance and president of the board of Creation Justice Ministries (formerly the National Council of Churches eco-justice program). Mary has also served in senior positions with a number of secular environmental organizations, including the Earth Day Network, the League of Conservation Voters, and the National Audubon Society’s endangered species and trade and environment programs. She is a graduate of Stanford University and the University of California, Los Angeles School of Law. Joe Roman is a conservation biologist and researcher at the Gund Institute for Ecological Economics at the University of Vermont and a Hardy Visiting Fellow at Harvard University. His research, focusing on endangered species conservation and marine ecology, has appeared in Science, Proceedings of the National Academy of Science, Trends in Ecology and Evolution, and many other journals. Joe has received a Fulbright Fellowship in Brazil to research invertebrate conservation, a McCurdy Fellowship at the Duke University Marine Lab to examine the ecological role of whales in the oceans, and a AAAS Science and Technology Policy Fellowship to study the influence of biodiversity on human well-being. 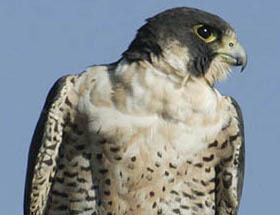 Maggie, the Peregrine Falcon hatched in the spring of 2014 – atop a building in downtown Richmond, VA that was on the Richmond Falcon Cam. Two days after fledging from her nest, the young falcon crashed into a building, severely damaging her left eye and fracturing the tip of her beak. Veterinarians at the Wildlife Center of Virginia treated Maggie’s eye with medication for several weeks, but about a month after admission, the veterinary team had to surgically remove the damaged eye. With only one eye, Maggie cannot see well enough to be released back into the wild. She currently serves as an education animal at the Wildlife Center. about the earth and it’s important inhabitants!